There are many reasons you may need a shipping office at the last minute. For one, a modular shipping office is easily transported and taken away at quick notice. For companies that do a lot of off-site work, such as construction companies, constructing an actual office is not only a hassle, but it is also not feasible. Many first-time shipping office buyers may have no clue where to start when it comes to purchasing a modular office. That is where we come in. When it comes to companies that sell modular offices, we are the company that goes above and beyond to make the process as easy and as simple as possible. If you have never purchased from one of the many modular shipping office suppliers, you might be curious what type of shipping office price you are looking at. When it comes to us at Panel Built, we try to keep the prices as low as possible. However, this does not mean that we at Panel Built skimp on the quality to keep the prices low. We try to give our customers the lowest prices, but at the highest quality. This is a standard that we stand by and will continue to stand by as our company grows. This is because having a mobile office is usually something not needed long-term and is usually needed at the last minute. There are so many reasons you should pick us at Panel Built to supply you with modular shipping office services available online. Often times, when a person is requesting cheap shipping office prices online, they need that mobile office in a hurry. We have eliminated the wait for our mobile offices so you never have to wait more than two days to receive your new office. Also, the great thing about our Panel Built offices is that once you receive your office, the process is complete. Your office is already fully constructed off-site and comes ready to be used. You also have the option to either have your office delivered to you by LTL Carrier or, if distance permits, you can also come pick it up at a designated location. We at Panel Built offer many different options when it comes to customizing your new mobile office. For example, we offer the office in white, champagne or grey to fit design needs. On the interior, however, you also have several different options available to you. You can choose either 8 or 10-foot walls depending on your preference. Also, you can choose your door size, with size options ranging from 3-0, 6-0 and 7-0. You also have many different options when it comes to having an HVAC unit. Your shipping office can certainly come pre-installed with a strong heating and cooling unit if you would prefer that option, as well. Just because we are a modular office shipping company that offers fast shipping doesn’t mean we do not provide excellent service to all of our customers. We believe in going above and beyond for each and every person that we work with. We treat each customer with the dignity and respect they deserve. Our team at Panel Built ensures that each customer is 100% happy with the process and the ultimate outcome they receive from us. We also believe in satisfying our customers with the actual product, as well. Each and every modular office we put out to the public is held to the highest standard and meets all regulations that you may encounter in a shipping office. Choosing to purchase a shipping office from Panel Built means you are choosing the best modular office you can purchase online or offline. Every single one of our offices meet the following regulations: Gyp panels with a polystyrene core, covered with stand vinyl, matching trims and doors, an A-B deck roof and more. Beyond that, you have the ability to create your custom office to the specifications you need and the preferences you want. Our sales and engineering office here at Panel Built will work with you from the moment you call our office to make sure the product you receive is exactly what you are looking for in a shipping office. We stand by our super-fast shipping and realize this is what makes us stand out from the competition. Our master plan is associated with our 2-day shipping and includes everything that you would need in a shipping office. When it comes to price, you cannot beat the value that we give you at Panel Built. Our prices are extremely affordable and our installation is fast and easy. Actually, every part of the process will be just as fast and easy as it is to install your new building. 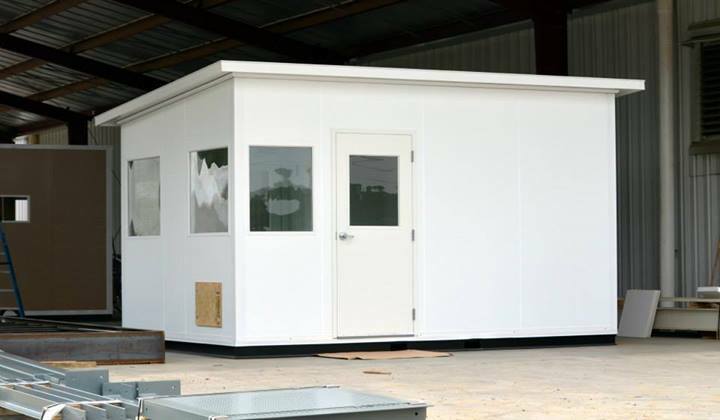 By calling Panel Built right now, you can begin the process by receiving a free quote and drawing of your potential mobile shipping office. Unlike other companies that offer you free quotes online or require a fee for a quote estimate, we assure accuracy, while also offering customer satisfaction by offering free quotes and consultations. If you are ready to get started designing your mobile office, give us a call today to receive your free quote.